I am always looking for a good homemade mac and cheese recipe and when I saw this recipe by Karina earlier this month I knew I had to try it. * So the original recipe called for grated parmesan... but I bought shredded. Then I got confused about what kind I should use so I ended up using the grated one (the "cheese sprinkles" as my kids call them. In hindsight I don't think you could go wrong either way. Also, the original recipe caleld for 6 oz of mozzarella cheese sliced... I used shredded because that's what I had on hand). Step 1 - Boil the pasta until it's JUST al dente. Drain, rinse with cool water and set aside. 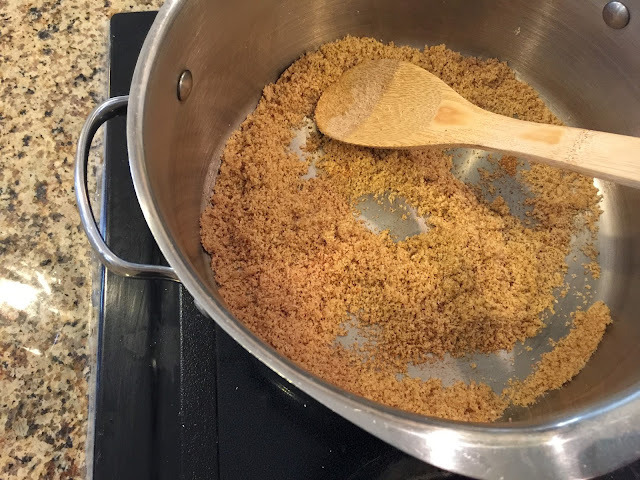 Step 2 - Melt 2 tablespoons of butter and then throw in 2/3 of a cup of breadcrumbs. Cook them until they're golden brown and then set them aside. Step 3 - Melt half a stick of butter (1/4 cup) in a pan with 4 cloves of minced garlic. The original recipe called for crushed garlic... but I just threw minced in there and it was perfectly fine. Cook for about a minute or two. Step 4 - Stir in the 1/4 cup flour and whisk it together over medium heat for about 2 minutes. Step 5 - Slowly pour in 4 cups of milk being sure to stir it as you go to avoid any lumps. Step 6 - While the sauce is heating to a boil mix the cornstarch in with 1/2 cup milk until it's all blended. Once the sauce is at a boil pour in the cornstarch/milk mix. Step 7 - Throw in 1 tablespoon of chicken bouillon, salt and pepper to taste and stir until it's all thick and bubbly. Step 8 - Remove it from the heat, throw in the cheese and stir. Step 9 - Mix the macaroni in with the sauce, stir it all until coated and then pour it into a baking dish. Step 10 - Top the macaroni with the breadcrumbs you prepared earlier and 1/4 cup of parmesan. Step 11 - Bake at 375 for about 10-15 minutes or until it's bubbly. Let it set for a few minutes before serving. Yes. Ma'am. I served it with grilled chicken and a salad and it was perfect. - If you (or your kids) don't love garlic, you could easily cut the amount in half. - Apparently my kids are weirdos and the boys weren't crazy about the breadcrumbs. Next time I make this I'll probably bake half of it with the breadcrumbs and then serve the other half just straight from the pot and extra creamy. - This makes a TON so it would be great to take to a party or serve as a side for a large group. No need to double the recipe which is always a plus. This looks so yummy!! Save this for later!! So, we have a Roomba and it's my best friend. Sometimes when he's stuck, I hate his guts...but for the most part, he delights me to no end! Yum! Well, this looks super cozy and delicious! I love a good Mac and cheese recipe! Okay, so I don't love our Roomba. I did at first, and now it just sits in the corner. Talk to me. Talk to all of us! I'm wanting one too! Why don't you love it? It's 6:30am and I want this now! Thanks for sharing! Confession: I have never made homemade Mac and cheese. How is that even possible? The recipe looks delicious. I may have to give it a try. You need the Roomba! My in-laws got one for us and it is a lifesaver. My husband has talked about getting another so that we have one for upstairs and one for downstairs! A Roomba is the best!!! Especially with young kids! Ours runs daily and i love it! You had me at extra creamy! I might need to test this out for thanksgiving! This looks so good!! I am now craving mac and cheese for breakfast!! NO!!! Girl get you a lodge cast iron! Totally budget friendly, and the BEST for oven/stove/oven type recipes. That Mac & Cheese looks insanely delicious! The cast iron looks like a must! Vacuum....why we have kids. Pass in the chore & get the cast iron! Martha Stewart has the same type of cast iron skillets as Le Creuset and much more reasonably priced and they go on sale often at Macys. Oh holy moly I will be making this asap! Mac n cheese is one of my favorite foods ever and this version sounds divine! Not to mention it's the one thing that we can always count on the kids to eat. Ha! Lodge, the original cast iron brand has cast irons that are super reasonable and my favorite!!!! Did you read the viral story about the Roomba and the dog poo? Honestly, I've decided they aren't for me after reading it. While my pets are accident-free (knock on wood), I shudder to think about it running through something in the middle of the night. Not to mention I don't want to have to pick up all the toys every night. Mac and cheese, though... yes please! I'm going to try this recipe this weekend! Is there a way that you can just copy and paste the directions at the very end of the blog post. I have made quite a few of your recipes and love them, but it'd be so easy if all of the instructions were in bullet form at the very bottom. The pictures help but if I am halfway through and have to scroll around, it takes a bit more time. Thanks!